Rupert Wace Ancient Art is a gallery situated at 19 Crown Passage, St James’s in London, and has been dealing in antiquities for over 30 years. The gallery specializes in works of art from ancient Egypt and the Classical world, the ancient Near East and Europe. The Gallery currently exhibits at the Winter Antiques Show in New York in January and TEFAF Maastricht in March. An annual catalogue of recent acquisitions is published to coincide with these events. An aesthetic appeal as well as good provenance are fundamental; authenticity and legal title are guaranteed. Rupert Wace is Vice Chairman of the Antiquities Dealers Association in the UK and board member of the International Association of Dealers in Ancient Art. He is also a member of BADA and CINOA. Clients include major international collectors as well as some of the world’s great museums such as the British Museum and the Ashmolean Museum in the UK; the Musée du Louvre, Paris; the Metropolitan Museum of Art, New York; the Museum of Fine Arts, Boston; the Museum of Fine Arts, Houston; the Antikenmuseum, Basel, and the Staatliche Sammlung Ägyptischer Kunst, Munich. Finely carved mask with large almond-shaped eyes hollowed along with the extended cosmetic lines and long eyebrows for inlays (now missing). 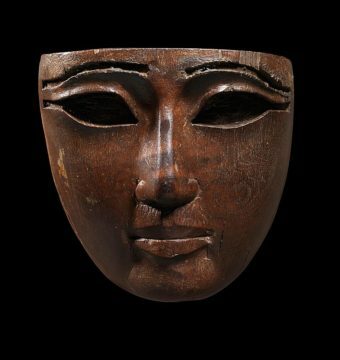 The top and back plain as it would have been inserted into an anthropoid coffin - the 'mask' carved by skilled craftsman, in this case from a dark hard wood (probably cedar) which did not occur naturally in Egypt and would have been specially imported.